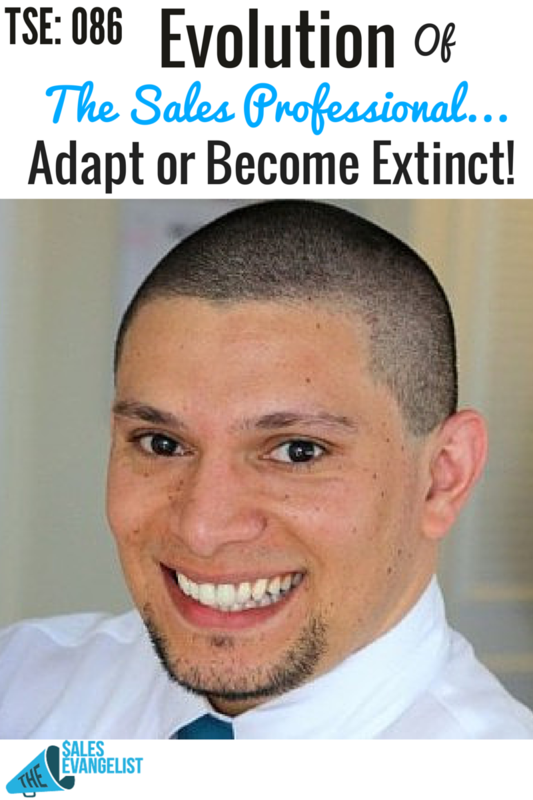 TSE 086: Evolution Of The Sales Professional….Adapt or Become Extinct! 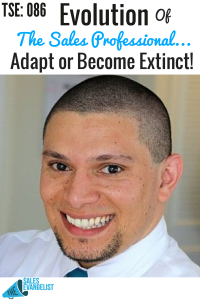 Home » TSE Podcast Post Page » TSE 086: Evolution Of The Sales Professional….Adapt or Become Extinct! BREAKING NEWS everyone! The sales professional is evolving. And the way that professionals are selling is changing rapidly too. Therefore, you need to keep up with the changes in the market as it continues to evolve. 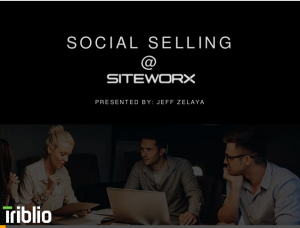 In this episode, I had the awesome opportunity to speak with Jeff Zelaya, a social connector, a leading social selling expert, and the head of sales over at Triblio, a flourishing startup company that provides content marketing software, allowing businesses to measure content marketing ROI through data driven approach. Jeff shares with us today a wealth of information, including the concept of how the sales professional is evolving and what YOU can do to make sure you evolve as a sales person and become a leader/authority in your field. You have to be open to evolve. Just because things have worked before doesn’t mean it will work tomorrow. So he went back to college and studied sales: how it evolves, how it integrates with marketing, how businesses are evolving because of digital media. People picked up the phone and it’s wass easy to build trust. People are not as cynical as they are today. More open to having dialogue, conversation more so than today. You can make things up and the buyer won’t have no way of knowing it. The sales rep controls the entire process. Pound the phone! Smile and dial! It’s a buyer’s market. The buyer is in full control. 70% of the buying process is already completed without sales being involved. Buyers are more educated and connected because of the Internet. Buyers are consuming about five different pieces of content before even speaking to a sales rep. In 2007, it shows an average of 3-4 cold calls before they can reach the prospect. Today, it takes 8 phone calls before you get hold of a live person. Double the work for the same pay off. 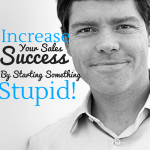 You still have to do some cold calling, advertising, canned pitches for certain scenarios. But start looking at new methods, new changes in your industry. Empower yourself with the right tools. Make sure you’re familiar with the technology. It provides value to people. It is a way to nurture your relationships. It educates your prospects so they can make the best decision. Sidekick by HubSpot: When you send out emails to a prospect, it allows you to see how prospects interact with your email. So you would know if they opened that email, if they’re clicking links in that email; if they’ve gone dormant and then opened it a couple weeks later – gives clarity to your job! Leverage your college – Go to your college page on LinkedIn and use your connections to get connected to the right people. Go to your competitor’s LinkedIn page – Click on the followers and it gives you a list of everyone following your competitor. They may be clients that you might want to win! Have a great LinkedIn page. It should be complete, with your picture, nice background, with media in it, and have a really awesome page because it’s your online business card! Being knowledgeable not just about their product or service but the space/industry very well. Show that expertise and people will trust you, shifting from being a salesperson to being a consultant. LinkedIn gives you a platform to create content through LinkedIn Publisher to write articles about your industry, observations, valuable information; and LinkedIn Publisher will promote that to your network to bring traffic to that page and further interaction and engagement. Do webinars or create podcast. Invite prospects to be part of your content. Ask them for their expertise. Feature them in your content like blog posts. Promote your prospects by sharing to other people. They end up promoting you and exposing you to more, future prospects. At the end of the day, it’s all about having conversations with real people. .You have to pick up the phone! Better yet, you have to meet them in person. As a social sales person, provide great value to your network and prospects…. Connect with Jeff at www.jeffzelaya.com. To know more about Triblio and get a free demo, visit www.triblio.com.